Breslin was born in New York City, the daughter of Kim (née Walsh) and Michael Breslin, a telecommunications expert, computer programmer, and consultant. She has two older brothers, Ryan and Spencer, who are also actors. The Breslin siblings live in New York in a "very close-knit" family. Her maternal grandmother, Catherine, died in June 2015. She is named after Abigail Adams, the second First Lady of the United States. Breslin was raised in the same Lower East Side apartment she still calls home (as of 2013). Breslin's career began at the age of three when she appeared in a Toys "R" Us commercial. Her first acting role was in Signs (2002), directed by M. Night Shyamalan, where she played Bo Hess, the daughter of the main character, Graham Hess (Mel Gibson). Signs garnered mostly positive reviews and was a box office success, grossing $408 million worldwide. Breslin's performance in the film was praised by critics. David Ansen of Newsweek wrote that she and co-star Rory Culkin gave "terrifically natural, nuanced performances". In 2004, she appeared in Raising Helen, in which she and her brother Spencer played siblings, but the film fared poorly. Breslin had a small role in The Princess Diaries 2: Royal Engagement. In the independent film Keane, she played Kira Bedik, a young girl who reminds the mentally disturbed protagonist William Keane (Damian Lewis) of his missing, abducted daughter. Keane had a limited theatrical release and grossed only $394,390 worldwide but it received positive reviews and Breslin's performance was praised by critics. Meghan Keane of The New York Sun wrote that "the scenes between Mr. Lewis and the charmingly fragile Kira, winningly played by Ms. Breslin, bring a captivating humanity to the film". Breslin's breakthrough role was in the 2006 comedy-drama Little Miss Sunshine, where she played Olive Hoover, a beauty pageant contestant, the youngest in a dysfunctional family on a road trip. She was cast at the age of six, years before filming was started. Her co-stars, Greg Kinnear and Alan Arkin, both stated that they were "astounded by her seriousness of purpose during shooting." Little Miss Sunshine was a critical and commercial success, grossing $100 million worldwide. Her performance was highly praised; Claudia Puig of USA Today wrote that, "If Olive had been played by any other little girl, she would not have affected us as mightily as [she] did." She received nominations for the Screen Actors Guild Award and Academy Award for Best Supporting Actress, becoming the fourth youngest actress to be nominated in that category. Although Jennifer Hudson won the Oscar, Breslin co-presented with actor Jaden Smith at the 79th Academy Awards on February 25, 2007. Breslin was part of the Disney Year of a Million Dreams celebration. Annie Leibovitz photographed her as Fira from Disney Fairies with Dame Julie Andrews as the Blue Fairy from Pinocchio. On October 27, 2007, Breslin made her stage debut in the play Right You Are (If You Think You Are) in New York City at the Guggenheim Museum starring in an ensemble cast, including Cate Blanchett, Dianne Wiest, Natalie Portman and Peter Sarsgaard. In 2007, Breslin was ranked #8 in Forbes Magazine's list of "Young Hollywood's Top-Earning Stars", having earned $1.5 million in 2006. Breslin next appeared in the 2007 romantic comedy No Reservations, playing the niece of master chef Kate Armstrong (Catherine Zeta-Jones). The film garnered mostly negative reviews but was successful at the box office, grossing $92 million worldwide. Roger Ebert wrote that Breslin "has the stuff to emerge as a three-dimensional kid, if she weren't employed so resolutely as a pawn." In 2007, she also starred in Definitely, Maybe, as the daughter of a recently divorced father (played by Ryan Reynolds); the film garnered generally favorable reviews, with Steven Rea of The Philadelphia Inquirer writing that Breslin is "alarmingly cute – but she backs the cuteness up with serious acting instinct." In 2008, Breslin starred with Jodie Foster in the film Nim's Island as Nim Rusoe, a young girl who lives on a remote tropical island. Nim's Island received mixed reviews but was successful financially, grossing $100 million worldwide. In 2008, she appeared in Kit Kittredge: An American Girl as the title character. The film was based on the American Girl line of dolls, books, and accessories of which Breslin is a fan. Kit Kittredge: An American Girl garnered favorable reviews and grossed $17 million at the box office. Breslin's performance in the film was praised by critics; Joe Morgenstern of The Wall Street Journal wrote that she "carries the event-stuffed story with unflagging grace." In 2009, Breslin appeared in My Sister's Keeper, where she played the role of Anna Fitzgerald, a young girl who was conceived to be a donor for her sister, Kate, who suffers from leukemia. Elle and Dakota Fanning were slated to play the roles of Anna and Kate respectively; however, Dakota refused to shave her head for the role, so she and Elle were replaced by Sofia Vassilieva and Breslin. My Sister's Keeper received mixed reviews but was a financial success, grossing $95 million worldwide. James Berardinelli wrote that Breslin and Vassilieva "display a natural bond one might expect from sisters, and there's no hint of artifice or overacting in either performance." Also in 2009, Breslin appeared in the horror comedy Zombieland as Little Rock. Director Ruben Fleischer said that "the dream was always to get Abigail Breslin" for the role. The film received positive reviews and was successful at the box office, grossing $102 million worldwide. With previews beginning in February 2010, she made her Broadway debut as Helen Keller in The Miracle Worker at the Circle in the Square Theatre. Breslin has said that she was honored to play Keller, who is one of her "biggest heroes". The Alliance for Inclusion in the Arts, an advocacy group for blind and deaf actors, criticized the play's producers for not casting a deaf or blind actor in the role. Lead producer David Richenthal defended the decision, stating that he needed a well-known actress: "It's simply naïve to think that in this day and age, you'll be able to sell tickets to a play revival solely on the potential of the production to be a great show or on the potential for an unknown actress to give a breakthrough performance." Vision-impaired actress Kyra Siegel was cast as Breslin's understudy. Breslin's performance was praised by critics; Frank Scheck of The Hollywood Reporter wrote that she "well portrays Helen's feral rebelliousness in the play's early sections and is deeply touching as her character's bond with her teacher grows." Ticket sales for the play, however, were considered disappointing, and the show closed in April 2010. In September 2009, Breslin filmed in Des Moines, Iowa, playing the title character in the film Janie Jones: a 13-year-old girl who is abandoned by her former-groupie mother (Elisabeth Shue), and informs Ethan Brand (Alessandro Nivola), a fading rock star, that she is his daughter. The film premiered at the 2010 Toronto International Film Festival. In 2011, Breslin voiced Priscilla, a cactus mouse in the animated comedy Rango, and appeared in the romantic comedy New Year's Eve. In 2013, she appeared in the thriller The Call. The film received mixed reviews from critics. Andrew Barker of Variety wrote that Breslin "acquits herself well enough for a problematic role in which she's forced to cry and scream nearly continuously." The Call grossed $68 million worldwide. In 2013, Breslin also appeared in Haunter in the role of Lisa, a ghost who bonds with a future girl living in her house to stop an evil killing spirit with the help of his many victims. Breslin also starred in the film adaptation of Orson Scott Card's novel, Ender's Game The film received mixed-to-positive reviews from critics but it was a disappointment at the box office, grossing only $125 million worldwide from a $110 million budget. In July 2012, she was cast in August: Osage County, the film adaptation of the Pulitzer Prize-winning play of the same name, alongside Julia Roberts, Benedict Cumberbatch, and Meryl Streep. August: Osage County was released in December 2013, and received mostly positive reviews. In 2014, Breslin appeared in the crime drama Perfect Sisters. In January 2015, she was cast in Fox's horror-comedy series Scream Queens, which aired from September 2015 to December 2016. In April 2017, Breslin came forward and revealed that a partner with whom she once shared a relationship had raped her, and she has since been diagnosed with PTSD. She continues to advocate on behalf of victims of sexual assault. ^ Zekas, Rita (July 27, 2007). "Abbie shines". Toronto Star. Archived from the original on December 8, 2015. Retrieved August 20, 2012. ^ DeMara, Bruce (June 26, 2009). "Family strife lets Abigail Breslin show serious side". Toronto Star. Retrieved March 13, 2010. ^ Academy of Motion Picture Arts and Sciences (March 2008). "Oldest/Youngest Winners and Nominees for Acting, By Category". Awards Database. (AMPAS). Archived from the original on March 1, 2009. Retrieved February 1, 2014. Statistics are valid through the 2007 (80th) Awards, presented on February 24, 2008. [document last updated 3/08] ... (* indicates a win). ^ "Spencer Breslin profile at FilmReference.com". Retrieved June 29, 2015. ^ a b Todd, Jennifer (February 26, 2007). "Proud couple watches granddaughter at Oscars". Lancaster Online. Archived from the original on March 25, 2007. Retrieved March 12, 2007. ^ Breslin, Abigail (February 25, 2007). "The things they say". Contact Music. Retrieved March 12, 2007. ^ Miller, Gregory E. (December 21, 2013). "Stop telling Abigail Breslin she's all grown up". New York Post. Retrieved February 28, 2019. ^ Zekas, Rita (July 27, 2007). "Abbie shines on". Toronto Star. Retrieved March 13, 2010. ^ "Signs Movie Reviews, Pictures". Rotten Tomatoes. Archived from the original on February 10, 2010. Retrieved March 10, 2010. ^ "Signs (2002)". Box Office Mojo. Archived from the original on April 16, 2010. Retrieved March 10, 2010. ^ Clinton, Paul (August 1, 2010). "'Signs' a thrilling ride". CNN. Retrieved March 10, 2010. ^ Travers, Peter (August 2, 2010). "Signs". Rolling Stone. Retrieved June 14, 2011. ^ Ansen, David (August 5, 2002). "Families, Fear And Faith". Newsweek. Retrieved March 10, 2010. ^ "Raising Helen Movie Reviews, Pictures". Rotten Tomatoes. Retrieved March 10, 2010. ^ "Keane (2005)". Box Office Mojo. March 10, 2010. Retrieved June 29, 2015. ^ Morris, Wesley (September 30, 2005). "A vivid look at an unraveling mind". Boston Globe. Retrieved March 10, 2010. ^ Atkinson, Michael (August 30, 2005). "Close Encounter". The Village Voice. Retrieved March 10, 2010. ^ Keane, Meghan (September 9, 2005). "Keane". The New York Sun. Retrieved March 10, 2010. ^ Gullién, Michael (July 20, 2006). "Little Miss Sunshine: Interview With Valerie Faris and Jonathan Dayton". Twitch. Archived from the original on January 4, 2011. Retrieved March 10, 2010. ^ Puig, Claudia (December 21, 2006). "Abigail: 'Little Miss Sunshine' highlights her winning ways". USA Today. Retrieved March 12, 2007. ^ "Little Miss Sunshine (2006)". Rotten Tomatoes. Archived from the original on August 30, 2008. Retrieved August 28, 2008. ^ "Little Miss Sunshine (2006)". Box Office Mojo. Archived from the original on March 2, 2010. Retrieved March 10, 2010. ^ Rooney, David (January 21, 2006). "Little Miss Sunshine". Variety. Retrieved March 11, 2010. ^ Stevens, Dana (July 25, 2006). "Little Miss Can't Be Wrong". Slate. Retrieved March 11, 2010. ^ Puig, Claudia (December 21, 2006). "These kids are golden". USA Today. Retrieved March 10, 2010. ^ Coyle, Jake (January 23, 2007). "Lil' Oscars: Breslin, 10, Wins Nom". The Washington Post. Retrieved March 11, 2010. ^ "highlights of the 79th annual academy awards". MTV. Retrieved June 28, 2013. ^ Gray, Iain (October 31, 2007). "Rachel Weisz transformed into Snow White". The Daily Telegraph. UK. Retrieved March 13, 2010. ^ Zap2It.com (February 28, 2007). "Olsens top young rich list". JAM! Movies. Archived from the original on June 4, 2008. Retrieved August 22, 2016. ^ "No Reservations Movie Reviews, Pictures". Rotten Tomatoes. Archived from the original on April 23, 2010. Retrieved March 10, 2010. ^ "No Reservations (2007)". Box Office Mojo. Archived from the original on March 23, 2010. Retrieved March 10, 2010. ^ Ebert, Roger (July 27, 2007). "No Reservations". Chicago Sun-Times. Retrieved March 10, 2010. ^ "Definitely, Maybe Movie Reviews, Pictures". Rotten Tomatoes. Archived from the original on January 3, 2010. Retrieved March 12, 2010. ^ Rea, Steven (February 14, 2008). "Witty, tender, definitely cute". The Philadelphia Inquirer. Retrieved March 12, 2010. ^ Greenblatt, Leah (April 9, 2008). "Nim's Island (2008)". Entertainment Weekly. Retrieved March 12, 2010. ^ "Nim's Island Movie Reviews, Pictures". Rotten Tomatoes. Retrieved March 12, 2010. ^ "Nim's Island (2008)". Box Office Mojo. Retrieved March 12, 2010. ^ Roberts, Sheila. "Abigail Breslin Interview, Kit Kittredge An American Girl". MoviesOnline.com. Retrieved March 12, 2010. ^ "Kit Kittredge: An American Girl". Rotten Tomatoes. Retrieved March 12, 2010. ^ "Kit Kittredge: An American Girl (2008)". Box Office Mojo. Retrieved March 12, 2010. ^ Puig, Claudia (July 3, 2008). "Spunky 'Kit' has kaboodles of charm". USA Today. Retrieved March 12, 2010. ^ Stein, Ruthe (July 2, 2008). "Movie review: Little miss 'Kit Kittredge'". San Francisco Chronicle. Retrieved March 12, 2010. ^ Morgensten, Joe (June 20, 2008). "'Kit Kittredge' Is a Rare Gift For Young Girls". The Wall Street Journal. Retrieved March 12, 2010. ^ Fleming, Michael (October 24, 2007). "Fanning sisters set for 'Keeper". Variety. Retrieved March 20, 2010. ^ Fleming, Michael (February 12, 2008). "Breslin, Vassilieva to star in 'Keeper". Variety. Retrieved March 20, 2010. ^ "My Sister's Keeper Movie Reviews, Pictures". Rotten Tomatoes. Archived from the original on October 22, 2010. Retrieved October 10, 2010. ^ "My Sister's Keeper (2009)". Box Office Mojo. Archived from the original on March 24, 2010. Retrieved March 13, 2010. ^ Berardinelli, James (June 26, 2009). "My Sister's Keeper". ReelViews. Retrieved March 13, 2010. ^ "Abigail Breslin Wants to Take on Darker Roles". Bloody Disgusting. ^ Rich, Katey (September 29, 2009). "Exclusive Interview: Zombieland Director Ruben Fleischer". Cinema Blend. Retrieved March 15, 2010. ^ "Zombieland Movie Reviews, Pictures". Rotten Tomatoes. Archived from the original on April 11, 2010. Retrieved March 13, 2010. ^ "Zombieland (2009)". Box Office Mojo. Archived from the original on March 30, 2010. Retrieved March 13, 2010. ^ "Sunshine star in Broadway debut". BBC News. October 29, 2009. Archived from the original on March 5, 2012. Retrieved October 29, 2009. ^ "A Day in the Life of Abigail Breslin". Playbill. March 9, 2010. Archived from the original on January 16, 2011. Retrieved October 22, 2010. ^ Rust, Katharine. "Things to Do". Time Out New York. Archived from the original on March 25, 2010. Retrieved March 13, 2010. ^ Healy, Patrick (October 29, 2009). "Advocacy Group Opposes 'Miracle Worker' Casting Choice". The New York Times. Archived from the original on November 17, 2010. Retrieved October 22, 2010. ^ Healy, Patrick (December 8, 2009). "Vision-Impaired Girl Gets Helen Keller Understudy Role". The New York Times. Retrieved October 22, 2010. ^ Gardner, Elysa (March 3, 2010). "Language a barrier for 'Miracle Worker,' but young stars shine". USA Today. Retrieved March 13, 2010. ^ Kuchwara, Michael (March 3, 2010). "The battle for Helen Keller remains compelling". Associated Press. ^ Brantley, Ben (March 4, 2010). "Taming a Child by Setting Her Free". The New York Times. Archived from the original on March 16, 2010. Retrieved March 18, 2010. ^ Scheck, Frank (March 3, 2010). "The Miracle Worker – Theater Review". The Hollywood Reporter. Retrieved October 22, 2010. ^ Gamerman, Ellen (March 8, 2010). "'Miracle Worker' on B'way May Shutter". The Wall Street Journal. Retrieved March 13, 2010. ^ Gans, Andrew (March 28, 2010). "The Miracle Worker Will Go Dark; Final Broadway Performance Is April 4". Playbill. Archived from the original on March 31, 2010. Retrieved March 31, 2010. ^ "Abigail Breslin, Mira Sorvino, Peter Fonda movies filming in Des Moines" Archived December 1, 2015, at Archive.today, Des Moines Register. Retrieved June 29, 2015. ^ a b "2010 Films – Janie Jones". tiff.net. Archived from the original on December 2, 2010. Retrieved October 21, 2010. ^ "Little miss big star: 'Rango' actress Abigail Breslin stays grounded on her Manhattan home turf". Daily News. New York. March 5, 2011. Retrieved January 19, 2012. ^ Travers, Peter; Travers, Peter (December 8, 2011). "New Year's Eve". Rolling Stone. Retrieved March 21, 2019. ^ "The Call". Rotten Tomatoes. Retrieved March 16, 2013. ^ Barker, Andrew (March 11, 2013). "Film Review: 'The Call'". Variety. Retrieved March 16, 2013. ^ "The Call (2013)". Box Office Mojo. Retrieved December 11, 2013. ^ "Film Review: Haunter (2013) | HNN". horrornews.net. Retrieved November 27, 2018. ^ Vary, Adam B. (December 21, 2011). "Harrison Ford, Abigail Breslin set to play 'Ender's Game'". Entertainment Weekly. Retrieved December 31, 2011. ^ "Ender's Game (2013)". Rotten Tomatoes. Retrieved December 25, 2013. ^ Mendelson, Scott (December 20, 2013). "Box Office Catch-Up: 'Escape Plan' Huge In China, 'Ender's Game' Flops Everywhere". Forbes. Retrieved December 14, 2013. ^ "Ender's Game (2013)". Box Office Mojo. Retrieved June 30, 2014. ^ Patten, Dominic (July 19, 2012). "Abigail Breslin Heading To 'August: Osage County'". Deadline Hollywood. Retrieved August 1, 2012. ^ "August: Osage County (2013)". Rotten Tomatoes. Retrieved January 19, 2014. ^ "Lea Michele, Joe Manganiello, More Join Ryan Murphy's 'Scream Queens'". The Hollywood Reporter. January 17, 2015. Retrieved January 18, 2015. ^ "Abigail Breslin Reveals She Was Sexually Assaulted: 'I Knew My Assailant'". People Magazine]]. April 12, 2017. Retrieved December 23, 2018. ^ "33rd Annual Young Artist Awards". YoungArtistAwards.org. Archived from the original on April 4, 2012. Retrieved April 7, 2012. 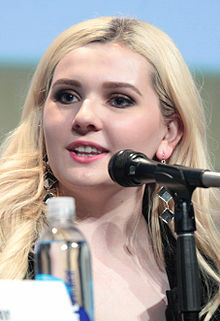 Wikimedia Commons has media related to Abigail Breslin.